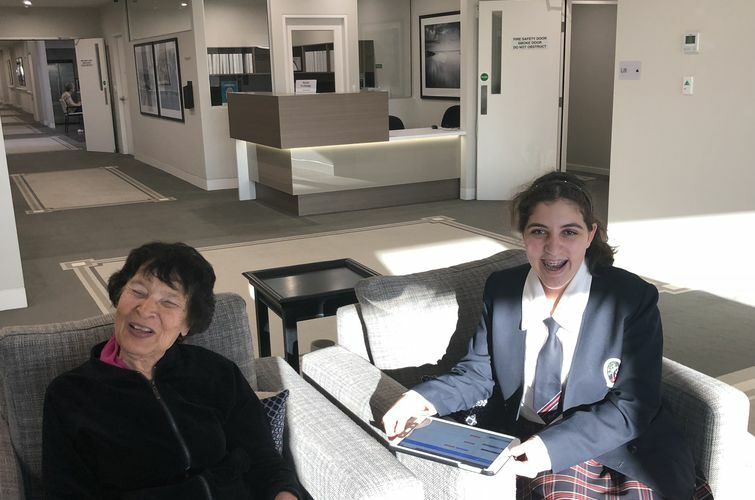 Tangara School For Girls started the ‘Write of Passage’ program this week; helping nearby Arcare Glenhaven aged care residents collect their life stories using new ICT & AI technology to create personalised memoir books. The technology makes the usually tedious and time-consuming process much easier, students use template questions and voice-to-text, so they can focus on enjoying the stories and expanding their worldviews, and edit the text afterwards. At the end of October, the Residents and their families will be presented with their personalised memoir book and the audio files of the stories. Often families say they miss their loved one’s voice after they’ve gone, so this is a cherished extra. Coordinator of Personalised Education at Tangara Girls, Rita Sakr, said “The students are very interested to meet older people in their community and hear some of the amazing life journeys they’ve had, from a time and place so different from what they are growing up in now. One Tangara students said, “My resident wasn’t very talkative, so I had to think of ways to prompt longer answers.”We all agreed that it was good practice for many situations. Often families regret not asking more questions or documenting their loved ones stories. It seems that by the time grandchildren are interested in their grandparents as people, those people are long gone. Initially I thought students could be an unrealised labour resource and useful in helping save some life stories and knowledge, but now it has become so much more. Kids are learning valuable life and communication skills, using technology as a tool, and older people are being cognitively stimulated as well as socialised. 25% of the population is going to be over 65 soon, so we need to raise children to be empathetic and respectful of older citizens, or there will not be enough people coming through to work in the required industries.